‘Left, we need to stay on the left!’ we were shouting at each other every time we re-entered the road. 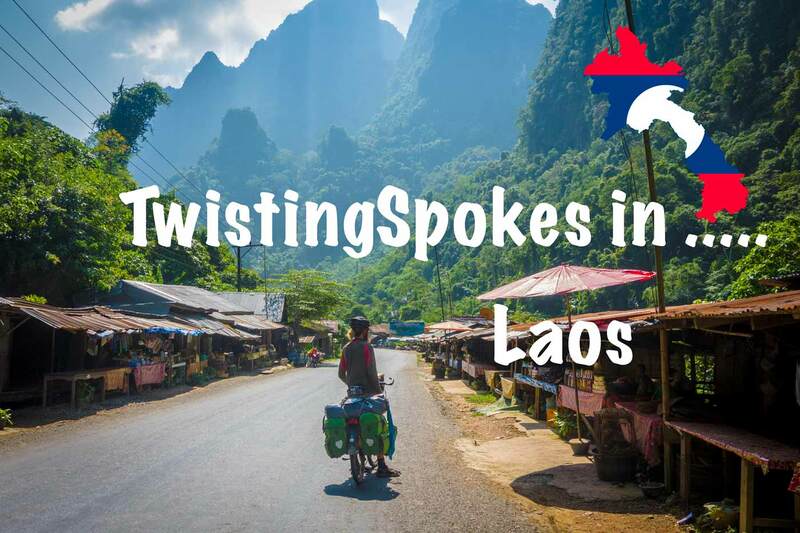 We had crossed over from Laos to Thailand and had not realised we also had to change the side of the road we drive on until we had passed the border and saw the signs. 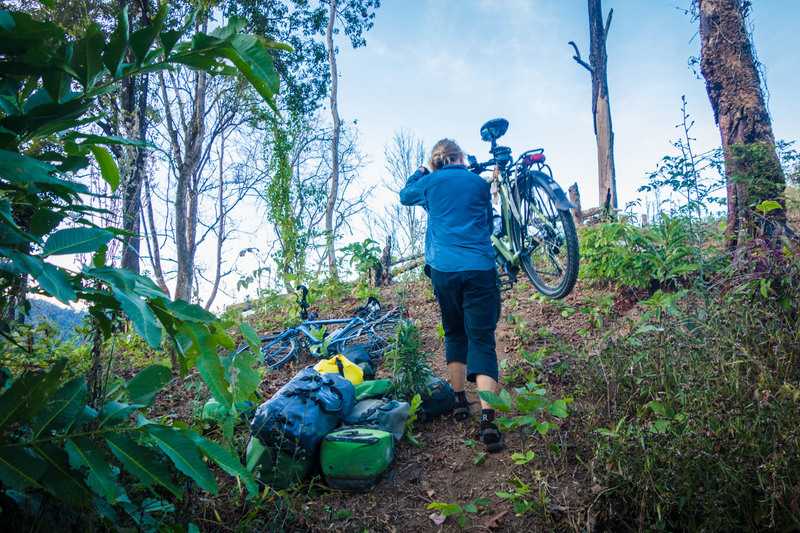 We had expected an easy ride from Vientiane to Chiang Mai, but in choosing off the beaten path roads we would be in for a surprise… We were in for stunning steep roads and jungle adventures. 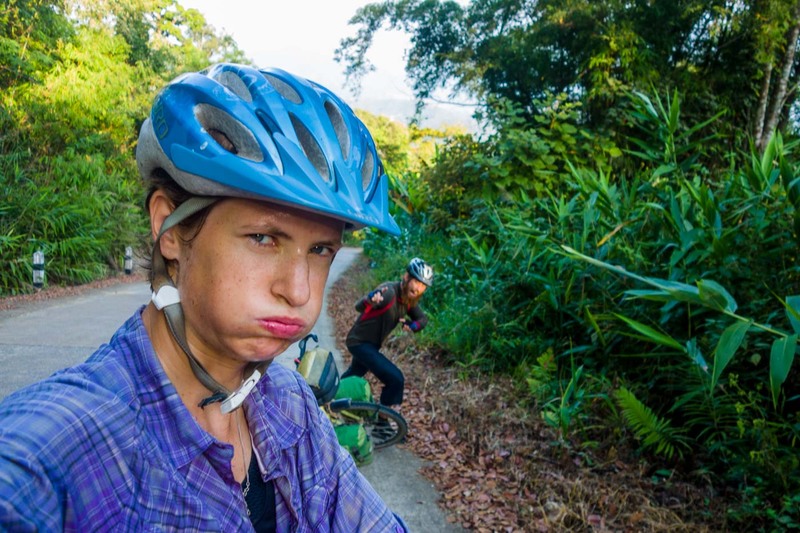 Photos of this part are here: Vientiane to Na Noi and Jungle to Chiang Mai. Vientiane had been nice. We met up with other cyclists Matthew, Mark, Henk, Trisha and met up again with Davide (who had his bike stolen in China) and Aurelie and Yann, with whom we had spent some days in Luang Prabang. In Vientiane we stayed at the Sports Guesthouse and the main reason to stay was to get visas for the oncoming countries. See our visa post for info. We left Vientiane on the same day as Aurelie and Yann, they were heading south, we were heading west to the most remote border between Laos and Thailand (but it is Thailand, how remote could it be?). The first day out of Vientiane was nice and easy along the Mekong with a decent asphalt road. We enjoyed the views of the mighty river while cruising along. 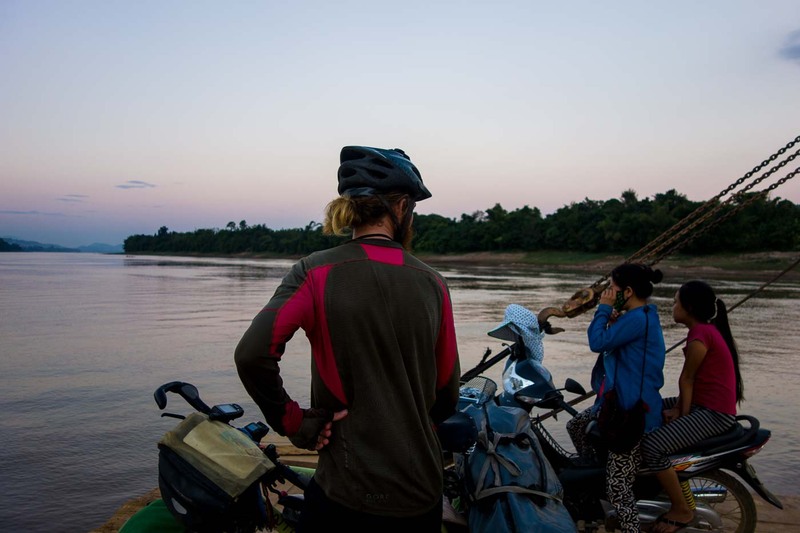 After a 100 km we found a small guesthouse in Ban Vang where we could stay for the night. It was only 30 km to the border we had researched. The border has only opened this year and we had not been able to find a lot of information about it. We were happy to be confirmed at the ridiculously large exit from the main road that we were heading to the Lao-Thai border. At the border they had not seen many foreigners crossing. It was hard for the border officials to understand our visa extension. They thought we had overstayed our visa. And then they said we needed a Thai visa, which we had. So we were good to go eventually. At the final check after having cycled up to the gate we got sent back to the main building. The officials had missed to stamp our visa with the word ‘used’. There is a small steep hill in between the Lao and Thai border buildings and on the top we were reminded we had to change sides. From now on we would be riding on the left side of the road. It was good there was nobody on the road so we could get used to this slowly. We were thinking why we hadn’t thought of the money and probably we had become a bit too lazy, together with South East Asia being more easy. The roads we had chosen though were not so easy and we entered a road through a national park where there was nobody. It was beautiful and quiet but we were interested when there would be any civilisation again. We heard sounds of which we thought they were monkeys and we road past heaps of dung on the road which smelled like how a zoo would smell. Our guess was that it was elephant dung, but maybe it was just our imagination and wishful thinking. We found a small hut where we could sleep in our inner tent off the ground behind a huge stack of hay. Early morning and we were ready to tackle the pass that was waiting for us. It was beautiful and quiet and we always enjoy climbing a mountain in the morning. The air is fresh and there was only very little traffic. We hoped there would be a place where we could fill our water supply and were very surprised when we reached the top of the pass and there were two small restaurants waiting for us. It was one of the best surprises on our trip when you don’t expect anything and all of a sudden there is a great fried rice and cold bottle of coke! We cruised down to Na Noi where we had decided to stay the night and found a cheap room at Ratchaprat guesthouse. The next day started and we didn’t know what we had gotten ourselves into. We knew there was a steep pass coming and had looked at alternative roads. But we also thought: ‘how hard can it be?’. Cycling on the other side down the mountain was just as steep so very hard on the brakes. The rims were hissing because of the heat. We reached a small village where a group of boys were playing football and found a small shop. Here a guy spoke some english and we figured out the language they were talking was Hmong. This was a Hmong village. We went around a corner and asked in another shop if we could sleep somewhere and were pointed towards a house which we thought was a homestay but later realised it was just a house of some friendly villagers. We were allowed to stay, camped on the balcony because it was very warm inside and were blessed the following morning with a piece of white string around our wrist. We had thought of maybe heading towards Phrae but then we would have a really short day. We also had the plan of visiting Lampang, so we decided to stick to our shortcut through the hills to Lampang. It was a really nice day with sun and some clouds to keep some of the sun off of us. We cycled on larger new asphalt roads and on small gravel paths through mountains with trees, fields with corn and fields with rice. And finally we were on a really nice road and the asphalt just stopped all of a sudden and the track turned to gravel. The road became very very small. We saw now that the route we had planned with google maps didn’t show on our open street map on our GPS. We were really off the beaten track now. We passed a final house with 7 dogs going crazy but managed to scare them off and we carried on. We were in the jungle following a small river and it was beautiful. We found an open space and started to set up camp before it would get dark. There must have been thousands of eyes watching us while we were sitting there from small bugs to birds, snakes and maybe even larger animals. We cooked with water from the small stream. It was really nice waking up in the peace and quiet with just birds. We packed our stuff and continued on our way. Until yesterday the gravel path had been okay. We started off today with crossing through the riverbed, and again and then the track went up the riverbed. And then the whole track disappeared. We were pushing our bikes because cycling was no option anymore and half of the time was in the river bed with deep sand. There were a few motorcross tracks which we tried to follow but at one point even these stopped. We knew we had about 6 km until we would reach another road. This was a good challenge. These 6 km took us almost 2 hours to complete at the start of the day. It was an experience though! After reaching the crossing we found asphalt only for it to stop again after 500 meters. This time the gravel road stayed although it was narrow a few times. Martin has recently been obsessed by finding his own papaya. Usually the papaya we see on the road are next to a small house. All the people grow their own papaya and consume them and we haven’t been able to find them at village markets. We were following a railway through the middle of nowhere on this small gravel track and suddenly Martin stops and walks down to cross the small river to the other side. Susanne can feel he has a plan and he sure has. A few minutes later he returns triumphantly with not one but with two fresh and ripe papayas. He dodged a scary huge spider and we were ready to eat one of these fruits of the jungle. After having eaten one of them and fixed the other on the back of Mojo we continued on the track and met an enthusiastic local hunter who said to us that the top of this little pass was coming soon and could confirm that we could reach Lampang heading this was. By the end of the afternoon and even more small roads we finally rode into Lampang and found a small room at Chita Guesthouse. We had two route options from Lampang to Chiang Mai. Secondary roads which would be 120 kilometers and up and down and would take a day and a half. Or the main super highway 11 which would be 100 km and doable in one day. We had contacted our Warmshower hosts Katie and Jared. They have been following us on our journey since we were cycling in South Korea. 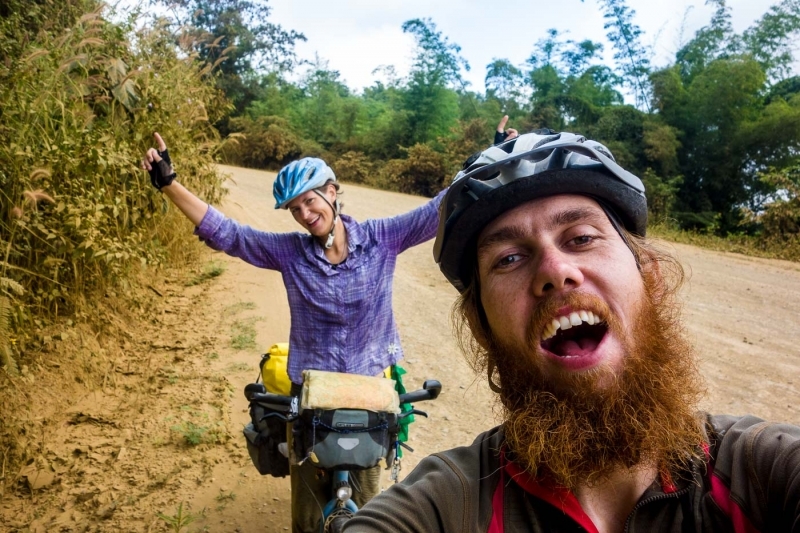 They have cycled quite a few of the roads that we have also done in the Pamirs, Western China and South Korea. They also have a blog: Braking Boundaries. 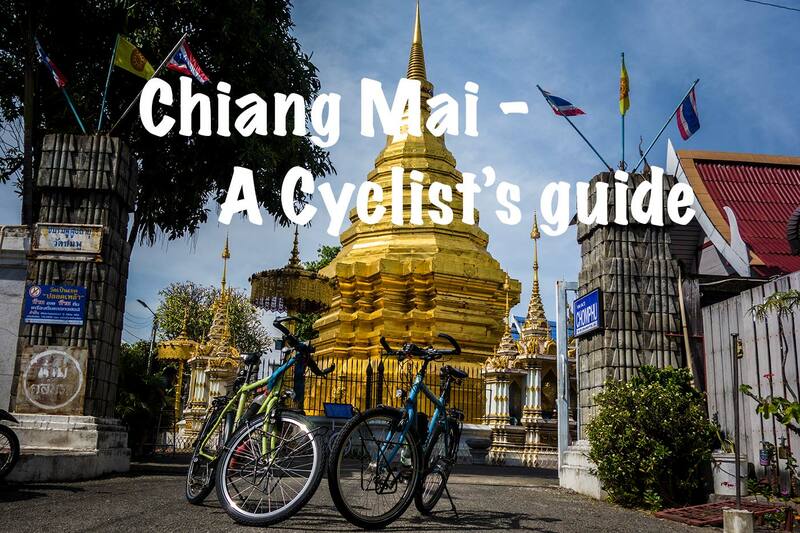 We were quite enthusiastic with the possibility of reaching Chiang Mai and sharing bicycle touring stories. So we opted for the super highway. It was a mind numbing day with a lot of traffic, a few stops at 7/11 to replenish, our second papaya which we thoroughly enjoyed and we made it into the city and out to the area where Katie and Jared live, our safe haven for a few days while we explore Chiang Mai and find our own little residence for a while. The plan is to stay for a month or so and work on some personal projects and think about future steps. Wow. I don’t know what else to say, apart from ‘fantastic!’.